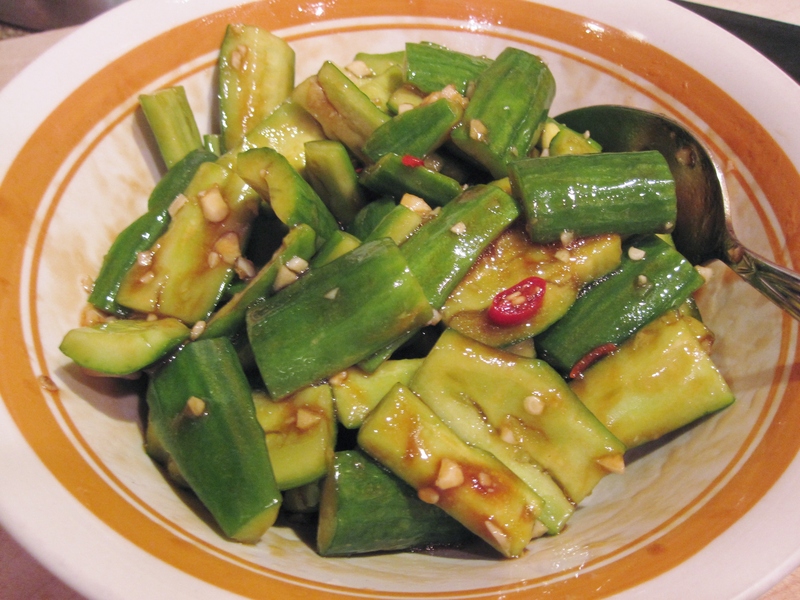 My dear Chinese friends, are you tired of all the Chinese New Year foods? Want something light, healthy and simple? Look no further. This is very simple to prepare and easy on your tummy! Bonus is that you can prepare ahead of time! Fill a large bowl with some water (enough to soak eggplants after they are cut), add in 2 tbsp white vinegar. Start the steamer on high heat. Wash eggplants and remove the stem caps. Cut into 3-inch length pieces, then cut in half lengthwise. Immediately soak cut eggplants in vinegar water. Since eggplants tends to float on the top, use something heavy (pot, plate, bowl etc.) on the top to press down eggplants, so they are totally submerged in vinegar water to prevent discoloration after cooking. Drain the water. Place eggplant in steamer with skin side face up. Steam on high heat for 3 minutes. Remove and let cool. Cut eggplants into strips then place in a bowl or deep dish plate. Spoon over the sauce and garnish with cilantro. Served cold or room temperature. Black rice vinegar 黑糯米醋: I like to use black rice vinegar in this recipe because it’s less acidic than typical white vinegar and has a some sweetness to it. If you use white vinegar, use less amount and increase amount of sugar. To prevent eggplant from discoloration after cooking, soak in vinegar water and steam with skin side face up. Melt butter in a sauce pan, sauté garlic and onion for a few minutes. Set aside to cool slightly. Add all ingredients and sautéed onion in a mixing bowl. Mix with a spoon to combine. Pour mixture into a 9″ pie dish. Smooth the surface and sprinkle extra mozzarella cheese on top. Bake at 375 F for 15-20 minutes, until it’s bubbly and the top crust is golden brown. Serve hot with sliced bread or crackers. Crab: Dungeness crab meat taste better than canned crab meat. Picking the meat out takes some time but can be done 1-2 days ahead and kept chilled in fridge. For adventurous eaters, creamy yellowish crab brain inside the body shell (scoop out with a spoon and put in a separate container and keep chilled) can also be added for more flavor. When sautéing onion, add this creamy goodness to sauce pan and cook until the oil starts separating, stirring at all times. This will take a few minutes. Mozzarella cheese: add more mozzarella cheese if you want more cheese stringy look, but not too much as it will change the texture of the dip. Flavor: sugar is added to help bring out the sweetness of the crab meat, so it has a sweet taste along with savory. Do not add too much salt or the flavor will change. Yes, century eggs! The egg white part looks like clear brown jelly sometimes with needle marks like snowflakes, and it tastes like harden jelly, a bit rubbery with a very mild flavor. The greyish yolk, however, carries a pungent smell and more flavorful. Sometimes the yolk is a bit soft in the center, as you slice through the gooey yolk will stick to the knife. For preserved eggs, I like salted eggs better than century eggs. However, one time when I tried this cold appetizer at a Hunan restaurant and I fell in love with it. It is quite easy to make. The combination of roasted peppers (sweet and spicy) and century eggs blends pretty well; a great side dish to go with just a bowl of steam rice. If you can take spicy foods and century eggs, try it out. Cut bell peppers in half, remove stems and seeds. Drizzle with little oil and roast in the oven at 375°F for about 30 minutes. Cool then peel off the skin. Cut into strips. Fire roast jalapeno peppers directly on top of flame until the skin turn black completely. I always put jalapeno peppers on a skewer, and roast them directly on the flame on my gas stove top. At first the skin will make little crackling sound then it will start blacken, but hardly any smoke. When the peppers are blackened, remove from flame and cover them with a paper towel for a couple of minutes. Use the paper towel to rub off the blackened skin and remove the seeds. Cut into strips. For century eggs, remove the shells and cut into thin wedges. 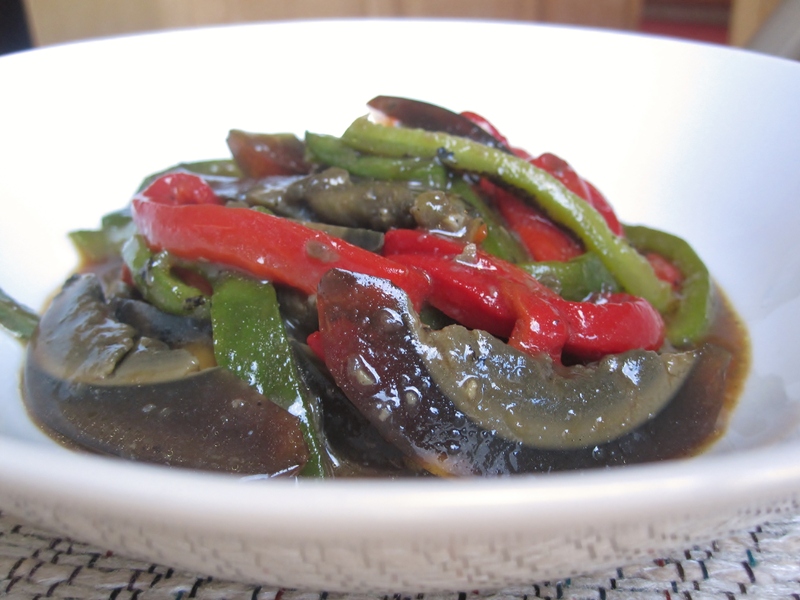 Put bell peppers, jalapeno peppers, century eggs and seasoning a bowl. Toss gently to mix the flavor well. Serve immediately. Do not mix in seasoning if serving the dish later as it will becomes watery. Only mix in seasoning a few minutes before serving or the dish will get watery the longer it sits in the seasoning sauce. My family loves avocados and of course guacamole too. 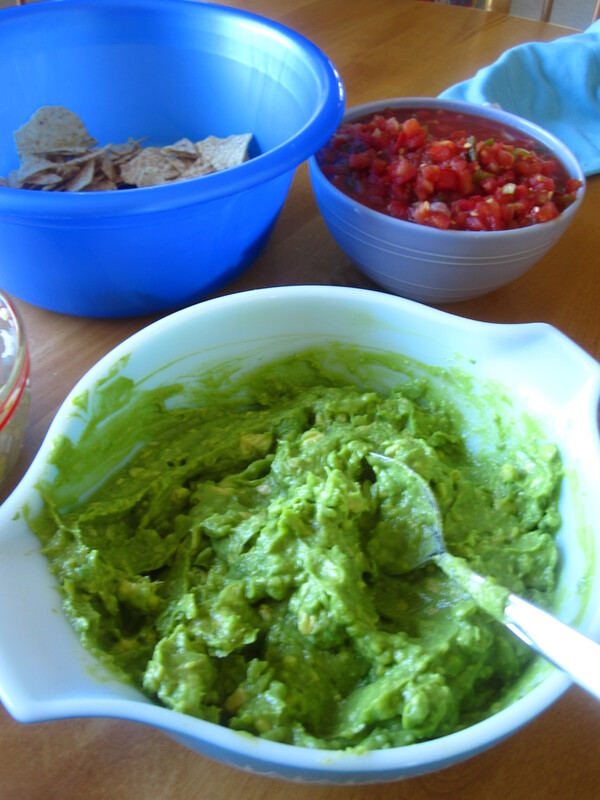 This is a basic guacamole recipe. However, feel free to add tomatoes, onion, jalapeno peppers, cilantro, drizzle of lime juice (to prevent it from oxidizing and turning brown color) etc. 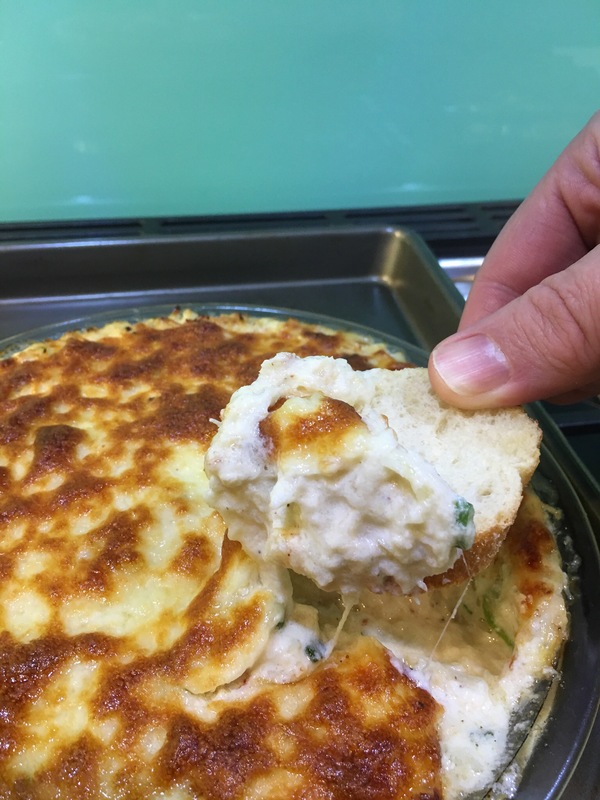 I make this dip many times for gathering. It’s so easy to make– all you do is season and mix it up. Ordering guacamole from a restaurant is expensive, but if you make it yourself I guarantee it will be cheaper and taste much better. Cut avocados into halves, remove seed and scoop out the flesh into a bowl. Add garlic, salt and ground cumin, use a fork to mash up to desired chunkiness. Eat with tortilla chips or as a spread for bread, burger or sandwich.